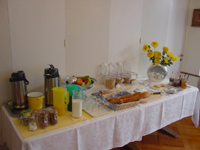 From Monday to Friday (without holidays) we offer a nice breakfast buffet from 6.45 to 9 o’clock. 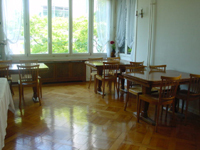 The dining room is a place for our students to eat together, studying, playing together or to spend time with visitors. Just next to the dining room there is a chilly TV room with a big Sofa and a DVD Player. 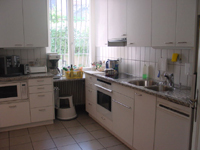 The kitchen is equipped with modern kitchen equippment and can be used from our inhabitants. The cleaning is done by each user herself. 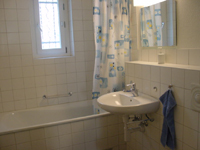 On each floor there are 2 bathroom with shower/toilet of bathtube/toilet for our inhabitants to share. Our cleaning staff is cleaning the bathroom onces a week.